Dailey Inspiration for Living Your Ultimate Life! I would like to extend a personal invitation for you to join me at a life-changing event that will uplift, inspire and bring passion into your life! Join this year’s Celebrate Your Life conference taking place on November 4 – 7, 2011 in beautiful Phoenix, Arizona. This year’s conference features bestselling authors Dr. Wayne Dyer, Doreen Virtue, Neale Donald Walsch, Lisa Williams, Dr. Jill Bolte Taylor, Harville Hendrix, John Holland, Gregg Braden, Dr. Andrew Weil and many more powerful presenters. The event will take place at the breathtaking JW Marriott Desert Ridge Resort & Spa. Special room rates for Celebrate Your Life attendees are now available for only $197 per night. To obtain our special conference rate you must tell the Resort that you are with Celebrate Your Life. 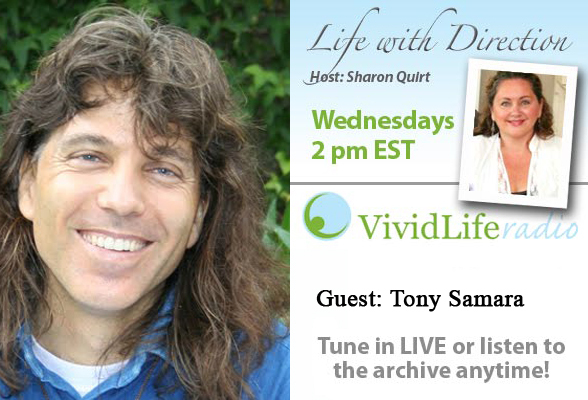 Stay tuned for our upcoming interviews on VividLife Radio with many of the Celebrate Your Life presenters including: Doreen Virtue, Lisa Williams, Denise Linn, James Van Praagh, Neale Donald Walch, Alan Cohen, Gregg Braden, Dr. Joe Dispenza and more! Please enjoy this update and remember to give the gift of daily inspiration just scroll down on our fanpage and simply click share or retweet any of our messages on twitter! Thank you for all you bring to the world! What does it take to get you through the day or night? When things are not going your way or they look topsy-turvy and you just want to scream; when your life appears chaotic and you are not sure if you are coming or going; when it feels like it is all piled on your shoulders, then this is the ideal moment to just stop, be still, and breathe. Life is an exciting and outrageous adventure. Isn’t it a wonder how a spider weaves a web or a bee makes a hive? Did you ever notice the everyday miracles, like your breath? Isn’t it amazing that this greatest wonder of it all is right under your nose? Click here to continue reading!!! Meditation helps us manage our thoughts and feelings. In this meditation we observe our thoughts. This helps us build awareness of how our mind works and softens our reactive patterns. After watching this meditation we recommend that you find some quiet time when you can practice noticing the space between your thoughts. 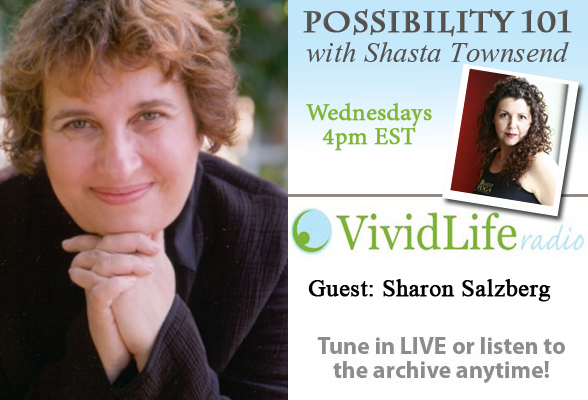 Possibility 101 host Shasta Townsend chats with Sharon Salzberg on Real Happiness, the power of Meditation. Sharon will explain how meditation works and why a daily meditation practiceresults in more resiliency, creativity, peace, clarity, and balance. Monday August 29 2PM EST listen to Inspired Business with Michele Molitor and co-host Mai Vu as they talk about Anything you Wantand challenge themselves and You the listeners, to tap into place of what worth doing and do more of THAT! Wednesday August 31 2PM EST listen to Life with Direction with Sharon Quirt as she chats with Dr. Shefali Tsabary on Conscious Parenting. Shefali lectures extensively on Mindful Living and Conscious Parenting around the world and currently has a private psychotherapy practice in New York city. Her first book, “It’s a Mom: What you should know about the early years of motherhood” debuted on the Indian bestseller list for four weeks. “The Conscious Parent” is her second book. Friday September 10AM EST listen to Intuitive Insights and Distant Energy Healing with Jenn Royster as she chats with this weeks special guest Monique Chapman, a leading international Intuition Lifestyle Consultant and Transformation Movement expert well-known in the arena of personal empowerment coupled with intuitive skills. Monique has over 3 decades of experience inspiring individuals and small businesses to achieve their optimal potential. Jenn and Monique will be taking your calls during the show. Friday September 02 12 PM EST listen to Magic of Life with Max Ryan as he chats with his special guest Tina Greenbaum on an online teaching program called the Couples Survival Toolkit. A 5 week course will reach the assists in helping couples improve their relationships: mind, body and soul. CEO & Co-Founder of Mishka Productions and the Celebrate Your Life conference, not only is Liz Dawn fabulous at creating magnificent spiritual events, she is also an expert on dysfunctional dating, but she is an expert on how to stop dating and create a healthy loving relationship. She is not a relationship expert, but rather focuses on the dating process and how to find your life partner. Liz has vast personal experience of dating and dating and dating and dating until she was 47 years old and finally figured out the formula to stop dating and find love. At age 49, Liz put everything she learned into action and found her life partner and married for the first time. She and her husband Jeff, are an amazing example of a spiritual, compassionate and loving partnership. for more about Liz Dawn click here!!! Filed Under: AMERICAN [U.S.A.], FEATURED EVENTS Tagged With: 2011 in beautiful Phoenix, A Celebration of Women, Alan Cohen, Arizona, Buddha, Celebrate Your Life!, Change Your Life, Cynthia James, Deb Shapiro, Denise Linn, Direction host Sharon Quirt, Doreen Virtue, Dr. Joe Dispenza, Gregg Braden, James Van Praagh, JW Marriott Desert Ridge Resort, Lisa Williams, Michele Molitor, Monique Chapman, Neale Donald Walch, November 4 - 7, path that leads to wisdom, Real Happiness, Sharon Salzberg, spirituality, Take Action, Tony Samara, visionaries, Wayne Dyer, women taking action, women. Hi I received the monthly email and I got rid of it and I was wanting to get more information on the man and his book about 2012 “stuff” and where you could sign up to listen to him about his book. Please help.